Whether you’re recruiting new members, energizing the ones you have, generating revenue, or advocating for your cause, Tizra helps you unleash the power of your content to achieve your goals. Tizra provides everything you need to go online with your own branded storefront selling digital products ranging from podcasts to reports to newsletters to ebooks with amazing flexibility. Promote content with time-limited samples, discount coupons, targeted offers, SEO and social media. Sell time-limited subscriptions or perpetual access, individual licenses, corporate and institutional packages. Create new product packages from existing content with our dynamic collection tools. And with our beautiful new design templates, you can have your sleek, new mobile-optimized shopping destination live in less than a day! Challenge: The Auto Care Association needed a secure, convenient and integrated online destination where members and non-members could buy and access their industry-leading guides and resources. Solution: Tizra’s Quickstart template allowed Auto Care to get the site up and running quickly with their own branding. Tizra’s online reader enabled them to deliver richly designed content, while still keeping it secure. And a quick SSO integration enables users to log in using their existing usernames and passwords. Result: A beautiful, mobile-friendly digital hub that creates a great user experience around Auto Care’s content, while still protecting its value. Easy search helps users unearth what’s most important to them…even on mobile devices. Curation tools help you keep it fresh by creating collections around trending topics, audiences or events. Access management and paywall lets you control exactly who has access to what, and charge admission for some, none, or all of it. Turn your history into an evolving resource that’ll keep users coming back. Don’t let it gather dust! Challenge: Turn a 95-year archive of the American Ceramic Society’s flagship Bulletin into a valuable member benefit and source of new revenue. 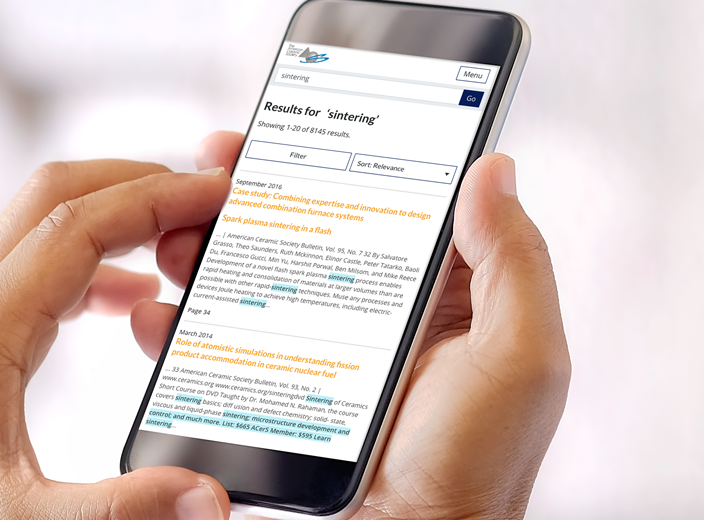 Solution: Tizra’s powerful search indexed tens of thousands of pages of PDFs, making it easy for users to find what they’re looking for…even on mobile devices. Flexible curation enabled Ceramics to package up articles into new products for sale. And institutional access tools enabled delivery to institutional customers. It’s an old conundrum: How to keep valuable content out of the wrong hands… without tech complications that frustrate legitimate users? Tizra gives you options to strike the right balance between convenience and security. Streaming document viewer lets you deliver content only as it’s needed. Since users don’t download the whole document, it’s difficult for them to steal. Plus, you can revoke access at any time. Personalized watermarking stamps each page of a PDF with a customized message including the identity of the licensed user. Usually this is enough to discourage piracy, but when it’s not, you at least you know who the culprit is. Precise access management lets you limit access to specific pages, by user or by group, and also lets you track and limit the number of downloads for each file. Your content is a valuable asset. Tizra helps you use it but not lose it. Challenge: The American Dental Association needed to improve access to content in a wide range of formats, ranging from videos to ebooks, while protecting intellectual property that contributes millions of dollars a year to ADA’s mission. Solution: An integrated bookshelf page hosted on Tizra, providing unified access to a wide range of content. Tizra’s streaming online reader, redemption codes, watermarking and download limits protect content without the inconvenience and support costs associated with traditional DRM. Learning Management Software using APIs and open standards like LTI. Production, finance and fulfillment to create a seamless flow from content creation through delivery.